Following the Nissan financial turnaround, in 2002 Fortune awarded him Asia Businessman of the Year. In 2003 Fortune identified him as one of the 10 most powerful people in business outside the U.S., and its Asian edition voted him Man of the Year. Surveys jointly published by the Financial Times and PricewaterhouseCoopers named him the fourth most respected business leader in 2003, and the third most respected business leader in 2004 and in 2005. He quickly achieved celebrity status in Japan and in the business world, and his life has been chronicled in Japanese comics. Ghosn's grandfather was Bichara Ghosn, a Maronite Christian who emigrated from French Mandate Lebanon to Brazil at the age of 13, eventually settling in remote Guaporé, Rondônia, near the border between Brazil and Bolivia. Bichara Ghosn was an entrepreneur and eventually headed several companies, in businesses including the rubber trade, the sale and purchase of agricultural products, and aviation. His son Jorge Ghosn married a Nigerian-born woman whose family also came from Lebanon, and they settled in Porto Velho, the state capital of Rondônia. Carlos Ghosn was born on March 9, 1954, in Porto Velho. When he was about two years old he became sick after drinking unsanitary water, and his mother moved with him to Rio de Janeiro. He did not fully recover there, and in 1960, when Ghosn was six years old, he and his mother and sister moved to Beirut, Lebanon, where his grandmother lived. Ghosn completed his secondary school studies in Lebanon, at the Jesuit school Collège Notre-Dame de Jamhour. He then completed his classes préparatoires in Paris, at the Collège Stanislas and the Lycée Saint-Louis. He graduated as an engineer from the École Polytechnique in 1974 and the École des Mines de Paris in 1978. After graduation in 1978, Ghosn spent 18 years at Michelin, Europe's largest tire maker, initially training and working in several plants in France and Germany. In 1981, he became plant manager in Le Puy-en-Velay, France. In 1984 he was named head of research and development for the company's industrial tire division. In 1985, when Ghosn was 30 years old, he was appointed chief operating officer (COO) of Michelin's South American operations. He returned to Rio de Janeiro, reporting directly to François Michelin, who tasked Ghosn with turning around the operation, which was unprofitable and struggling under Brazil's hyperinflation. Ghosn formed cross-functional management teams to determine best practices among the French, Brazilian, and other nationalities working in the South American division. The multicultural experience in Brazil formed the basis of his cross-cultural management style and emphasis on diversity as a core business asset. "You learn from diversity ... but you're comforted by commonality", Ghosn has said. The division returned to profitability in two years. After turning around Michelin's South American operations, Ghosn was appointed president and COO of Michelin North America in 1989, and moved to Greenville, South Carolina, with his family. He was promoted to CEO of Michelin North America in 1990. He presided over the restructuring of the company after its acquisition of the Uniroyal Goodrich Tire Company. In 1996, Ghosn became executive vice president in charge of purchasing, advanced research, engineering and development, powertrain operations, and manufacturing at Renault; and he was also in charge of Renault's South American division, located in the Mercosur. Ghosn's radical restructuring of Renault successfully contributed to profitability of the company over 1997. His reputation of successful performance under François Michelin was repeated under the first CEO of the freshly privatized Renault. In March 1999, Renault and Nissan formed the Renault–Nissan Alliance, and in May 1999 Renault purchased a 36.8% stake in Nissan. While maintaining his roles at Renault, Ghosn joined Nissan as its chief operating officer (COO) in June 1999, became its president in June 2000, and was named chief executive officer (CEO) in June 2001. When he joined the company, Nissan had a consolidated interest-bearing net automotive debt of more than $20 billion (more than 2 trillion yen), and only three of its 46 models sold in Japan were generating a profit. Reversing the company's sinking fortunes was considered nearly impossible. Ghosn's "Nissan Revival Plan", announced in October 1999, called for a return to profitability in fiscal year 2000, a profit margin in excess of 4.5% of sales by the end of fiscal year 2002, and a 50% reduction in the current level of debt by the end of fiscal year 2002. Ghosn promised to resign if these goals were not met. Ghosn's Nissan Revival Plan called for cutting 21,000 Nissan jobs (14% of total workforce), mostly in Japan; shutting five Japanese plants; reducing the number of suppliers and shareholdings; and auctioning off prized assets such as Nissan's aerospace unit. 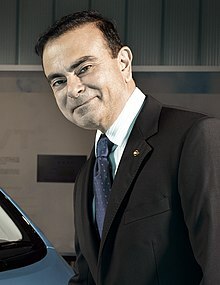 Ghosn was the fourth non-Japanese person to lead a Japanese automaker, after Mark Fields, Henry Wallace, and James Miller were appointed by Ford to run Mazda in the late 1990s. In addition to cutting jobs, plants, and suppliers, Ghosn spearheaded major and dramatic structural and corporate-culture changes at Nissan. He defied Japanese business etiquette in various ways, including by eliminating seniority-based and age-based promotion, by changing lifetime employment from a guarantee to a desired goal for when the company achieved high performance, and by dismantling Nissan's keiretsu system – an interwoven web of parts suppliers with cross-holdings in Nissan. When the Nissan Revival Plan was announced, the proposed dismantling of keiretsu earned Ghosn the nickname "keiretsu killer", and The Wall Street Journal quoted a Dresdner Kleinwort Benson analyst in Tokyo as saying Ghosn might become a "target of public outrage" if Nissan threw former affiliates out of its supply chain. Ghosn changed Nissan's official company language from Japanese to English, and included executives from Europe and North America in key global strategy sessions for the first time. In the first year of the Nissan Revival Plan, Nissan's consolidated net profit after tax climbed to $2.7 billion for fiscal year 2000, from a consolidated net loss of $6.46 billion in the previous year. Twelve months into his three-year turnaround plan, Nissan had returned to profitability, and within three years it was one of the industry's most profitable auto makers, with operating margins consistently above 9%—more than twice the industry average. The goals of the Nissan Revival Plan were all reached before March 31, 2002. In May 2002, Ghosn announced his next set of goals for the company, "Nissan 180", a three-year plan for growth based on the numbers 1, 8, and 0: By the end of September 2005, Nissan planned to increase its global sales by one million vehicles; and by the spring of 2005, it was committed to achieving an operating margin of at least 8% and reducing its net automotive debt to zero. These goals were all reached: In the spring of 2003, Nissan announced that its net automotive debt was eliminated in fiscal year 2002. Nissan's operating profit margin climbed to 11.1% in fiscal year 2003; it had been 1.4% in fiscal year 1999. In October 2005, Nissan announced that its annual sales from September 30, 2004, to September 30, 2005, were more than 3.67 million, up from the 2.6 million vehicles sold in the fiscal year ended March 2002. In May 2005, Ghosn was named president and chief executive officer of Renault. When he assumed the CEO roles at both Renault and Nissan, Ghosn became the world's first person to run two companies on the Fortune Global 500 simultaneously. In 2005, billionaire investor Kirk Kerkorian acquired a 9.9% stake in General Motors (GM) and seated one of his representatives on the company's board, then urged GM to investigate a merger with Renault and Nissan with Ghosn as the new chairman of GM. In 2006, GM's embattled management rebuffed the takeover attempt, and by the end of the year, Kerkorian's Tracinda Corp. sold most of its GM stock. In 2006, Ford Motor Co. made Ghosn a formal offer to lead the company, according to the book American Icon: Alan Mulally and the Fight to Save Ford Motor Company by Bryce Hoffman. Ghosn refused, reportedly saying the only way he would come to the struggling company was if he was named both the CEO and chairman of the board. Bill Ford Jr. refused to give up his chairmanship. In 2007, Ghosn led the Renault–Nissan Alliance into the mass-market zero-emission electric car market in a major way, and committed €4 billion (more than $5 billion) to the effort. In 2008, he confirmed that Nissan–Renault would bring an "entire lineup" of zero-emission electric cars to the worldwide market by 2012. In 2009, he told the University of Pennsylvania's Wharton School of Business, "If you're going to let developing countries have as many cars as they want—and they're going to have as many cars as they want one way or another—there is no absolutely alternative but to go for zero emissions. And the only zero-emissions vehicle available today is electric ... So we decided to go for it." The Nissan Leaf, an electric car billed as "the world's first affordable zero-emission car", debuted in December 2010. As of 2017, the Renault–Nissan Alliance is the world's electric vehicle leader, selling more than double the number of electric cars as Tesla, and the Nissan Leaf is the world's best-selling electric vehicle by a wide margin. Ghosn was a visible leader in recovery efforts after the Japanese earthquake and tsunami on March 11, 2011, one of the worst natural disasters in modern history. On March 29, 2011, he made the first of several visits to the hard-hit Iwaki engine plant in Fukushima prefecture, 50 km (31 miles) from the Fukushima Daiichi nuclear power plant, and at his direction Nissan restored full operations at the Iwaki factory well ahead of expectations. He appeared on television in Japan to encourage optimism. In May 2011, Ghosn remained committed to building at least 1 million of Nissan's cars and trucks in Japan annually. In June 2012, Ghosn was named deputy chairman of the board of directors of Russian automobile manufacturer AvtoVAZ. In June 2013, he was appointed chairman of the Russian company, a position he retained through June 2016. Renault had begun a strategic partnership with AvtoVAZ in 2008 by acquiring a 25% stake in the company; this led to increasingly deeper partnerships between Renault–Nissan and AvtoVAZ, ending in Renault–Nissan Alliance control of the Russian automaker in 2014. In February 2017, Ghosn announced he would step down as CEO of Nissan on April 1, 2017, while remaining chairman of the company. Hiroto Saikawa, succeeded Ghosn at Nissan.. In November 2018, Renault owned 43.4% of Nissan, while Nissan owned non-voting shares equal to 15% of Renault's equity. In October 2016, Nissan completed the acquisition of a controlling 34% stake in Mitsubishi Motors. Ghosn became, in addition to his Renault–Nissan posts, chairman of Mitsubishi, with an aim to rehabilitate the automaker after a months-long scandal involving fuel-economy misrepresentation and consequent falling revenues. The Nissan–Mitsubishi partnership includes partnership in developing electric automobiles for Mitsubishi, and the Renault–Nissan–Mitsubishi Alliance creates the world's fourth-largest auto group, after Toyota, Volkswagen AG, and General Motors Co.
Mitsubishi Motors board removed Ghosn from his role as chairman on November 26, 2018, following his arrest and ousting from Nissan for alleged financial misconduct. Ghosn served on the International Advisory Board of Brazilian bank Banco Itaú (a major party in the privatisation of Renault) until 2015. He is also a member of the Advisory Board of Tsinghua University School of Economics and Management in Beijing. He has received an honorary doctorate from American University of Beirut; and he is a member of the Strategic Council, Saint Joseph University of Beirut. In 2014 and 2015, he was elected president of the European Automobile Manufacturers Association. He serves as governor of the World Economic Forum. On 19 November 2018, Tokyo District Prosecutors arrested Ghosn at 4:30 pm upon his re-entry into Japan aboard a private jet that had come from Lebanon, for questioning over allegations of false accounting. Ghosn's top aide Greg Kelly, a Nissan director and former head of human resources, was also arrested upon his arrival from the U.S. that day. On the same day, Nissan chief executive Hiroto Saikawa announced at a press conference that Ghosn had been dismissed from Nissan's board and would be stripped of executive rights at a meeting to be held on 22 November. Saikawa stressed that the dismissal was the result of an internal inquiry by Nissan. Nissan Chief Executive Officer Hiroto Saikawa publicly alleged that Ghosn and Kelly under-reported their compensation (a violation of securities law) and used company assets for personal use.. While the allegations remained unproven in court, with due legal process pending, at the same news conference, Saikawa "expressed disappointment, indignation, and despair at Ghosn's conduct, which included using company funds for personal investments and misusing corporate assets" and also said, "This is an act that cannot be tolerated by the company ... It is sufficient grounds for his dismissal." Although the company did not provide details, reports in the Japanese media stated that Nissan was paying all or some of the costs at some amount of US$18 million for residences used by Ghosn in Rio de Janeiro, Beirut, Paris and Amsterdam, and that Ghosn charged family vacation expenses to the company. The purchases of some of these residences and the payment of expenses were handled by a shell company named Zi-A Capital BV based in the Netherlands, which Kelly had instructed Nissan's board to set up to make venture investments at the end of 2010 (around the same time as Ghosn's divorce from his first wife and beginning of a relationship with his second wife). Nissan funds were used to purchase Ghosn's Paris apartment in 2005, and Zi-A funds were used to purchase his $5 million beachfront Rio apartment in 2012 and his Beirut mansion, which, with renovations, cost over $15 million. Nissan compliance auditors began trying to track Zi-A activity in 2014 but were stymied at first by the chain of shell companies used in Zi-A investments. In addition, to avoid reporting the full amount of his compensation in Nissan financials, as required by Japanese law beginning in 2010, Ghosn had Kelly structure complicated deferred payment plans which went unreported under an aggressive interpretation of the disclosure rules which Nissan's outside auditors had not signed off on, and which totaled around $80 million at the time of his arrest eight years later. According to Nikkei reports, Ghosn told investigators that he instructed Kelly to handle the compensation reporting in a legal manner, and Kelly told investigators that he acted on advice from outside law firms and the Financial Services Agency in handling the reporting. Leaks to the media said that Ghosn had planned to call a vote to fire Nissan CEO Saikawa and reinstate Kelly (who had semi-retired to the U.S. in 2015) to active service at the scheduled board meeting. Ghosn was detained at the Tokyo Detention House, under Japanese rules that allow suspects to be detained for up to 23 days without criminal charges being filed. Ghosn and Kelly were reportedly arrested on information provided by an unidentified non-Japanese executive in Nissan's legal department, in the second deal ever struck under Japan's recently introduced plea bargaining system. Charges were filed against Ghosn and Kelly on the underreporting of deferred compensation on 10 December, along with allegations of additional charges that restarted a 10-day holding period without bail. Nissan also took control of the Rio and Beirut properties and changed the locks, which has led Ghosn's family to sue for access. On 21 December, Ghosn was re-arrested on suspicion of shifting to Nissan personal losses of US$16.6 million related to a personal swap contract in October 2008 (during the global financial crisis). The introduction of those charges prevented Ghosn's release on bail later the same day, because the new charges permitted an additional 10-20 days of incarceration prior to a bail hearing. Subsequent reporting linked this charge to Ghosn's dealings with Sheikh Khaled al-Juffali, the vice chairman of one of Saudi Arabia's largest conglomerates and majority owner of a company which owns half of a regional joint venture called Nissan Gulf, with the other half held by a wholly owned Nissan subsidiary. In return for a personal letter of credit from Juffali to Ghosn during the 2008 crisis, which served as bank-demanded collateral for Ghosn's swap contract, Nissan indirectly paid $14.7 million from an internal discretionary fund known as the "CEO Reserve" to a wholly owned Juffali company in four installments between 2009 and 2012, although the internal documentation did not specify the ultimate recipient. According to Tokyo prosecutors, Kelly was not involved in this transaction and so was released on bail on 25 December. Ghosn made his first public appearance after his arrest at an arraignment on Tuesday, 8 January 2019, where he asserted his innocence, making a statement in response to the main allegations against him; however, his bid to be released from prison on these charges was rejected. Ghosn's imprisonment was set to end on 11 January. That day, Ghosn was indicted on two additional charges: aggravated breach of trust and understating his income, once again extending his imprisonment. As a result, he could remain in jail for months more before a trial takes place.. Two days later, Nissan's investigation allegedly found that, in addition to the underreporting of salary already charged, Ghosn had paid himself an undisclosed $8 million in 2018 from a Netherlands-based joint venture owned by Nissan and Mitsubishi that was set up in 2017, without the knowledge of either company's directors because Ghosn had the sole authority to dispense cash from the venture. Ghosn again appealed the denial of bail from 8 January and offered to meet greater restrictions and higher guarantees of appearance in return for his release, including wearing an ankle bracelet and posting his Nissan stock as collateral. Additionally, on 14 January Ghosn's wife Carole published a letter that she wrote to Human Rights Watch protesting against his treatment in detainment. Nevertheless, on 21 January, the Tokyo district court denied his appeal, meaning that Ghosn is likely to remain in custody until at least the next regular review of his detention in March. Le Figaro and CNN have reported with the words hostage justice. In its report on the release of Carlos Ghosn, Financial Times stated that the Japanese judicial system is a country risk. On 11 January, José Muñoz, Nissan's chief performance officer and head of its China operations, resigned from the company, effective immediately. Muñoz, considered to be a close ally to Ghosn and a possible successor as CEO of Renault and Nissan, had been a "person of interest" in Nissan's internal investigation, with which he was reported to be uncooperative.. One of Nissan's three independent directors opined that Nissan may simply eliminate the position of chairman and not replace Ghosn, a route previously taken by other scandal-plagued Japanese companies. The Reuters Japan news service reported that Nissan may file suit against Ghosn personally. The French government and Renault had been reported to be standing behind Ghosn during his imprisonment, on the presumption that Ghosn is innocent until proven guilty. However, France's financial minister Bruno Le Maire stated on 16 January that Renault may seek a new CEO to replace Ghosn due to his continued incarceration. Renault also released a statement that day stating that the company is "actively working to find the best solution for the future governance of the group, with a view to preserving the company's interests and strengthening the Renault–Nissan Alliance". As reported by The New York Times, Renault's appointment of a successor might not be due to Renault changing its view about his innocence but rather an acknowledgement of his inability to perform his duties from a Japanese prison. Because Renault relies on significant financial contributions from Nissan under the Renault–Nissan Alliance, media reports say that Renault is worried that Nissan may be using the power vacuum at Renault to reshape the alliance’s balance of power. As a result, Ghosn resigned as chairman and CEO of Renault on 24 January 2019. On 30 January, Ghosn said the charges were "plot and treason" by executives at Nissan who opposed the relationship with Renault and a future plan that was in the works to integrate Nissan, Mitsubishi and Renault. In mid-February, Ghosn's lawyer Motonari Otsuru stepped down and was replaced by Jun'ichirō Hironaka [ja], who has a record of persistence in obtaining acquittals in a number of high-profile cases. In early March, Ghosn was granted a request for bail in a Tokyo court. The court set his bail at 1 billion yen, (about US$9 million). This was his third bail request, and the first by his new legal team under Hironaka. Hironaka has stated that it would be "impossible" for him to front the cash to be released on bail the same day due to issues with the bank used to pay the bail and an appeal by the prosecutor's office. The bail approval was conditional to stringent controls, such as not to travel abroad, but Okinawa, and out US Military bases space. He was released on March 6, 2019. Under strict bail conditions, Ghosn remains at a house under 24-hour camera surveillance with no internet access. On April 3, Ghosn tweeted that he was "ready to tell the truth" and that he would hold a conference on April 11. He was re-arrested for the fourth time early on April 4 over new suspicions of financial misconduct concerning alleged dealings via Oman. Ghosn released a statement claiming the arrest was "outrageous and arbitrary". The arrest comes after inquiries by French prosecutors into the purchase of a yacht by Ghosn via Renault-affiliated companies in Oman and Saudi Arabia. On 8 April 2019, during an extraordinary shareholders meeting, Nissan shareholders voted to remove Carlos Ghosn from the company board. Shareholders also voted to remove Ghosn's former right-hand man Greg Kelly, and to appoint Renault chairman Jean-Dominique Senard as a director. On 9 April, Ghosn posted a YouTube video, where he publicly stated that he was "innocent of all the accusations that came around these charges that are all biased, taken out of context, twisted in a way to paint a personage of greed, and a personage of dictatorship". He also claimed that the payments to Juffali were meant to help Nissan fix a dispute with a local distributor and to open a bank contract to convert his salary from yen to US dollars in order to avoid currency swings. By his first marriage to Rita in 1984, Ghosn is the father of four grown children: Caroline, Nadine, Maya and Anthony. They divorced in 2010. In May 2016, Ghosn married Carole Nahas and, a few months later in October, threw a large-scale party at the Grand Trianon of the Palace of Versailles, in the outskirts of Paris, to celebrate both the wedding and Carole's 50th birthday. He is reported by several Japanese media to have six private residences: in Tokyo, Paris, Rio de Janeiro, Amsterdam, Beirut and New York. Ghosn, whom Forbes magazine called "the hardest-working man in the brutally competitive global car business", splits his time between Paris and Tokyo and as of 2006 logged roughly 150,000 miles in airplanes per year. Japanese media have called him "Seven-Eleven" ("work very hard from early in the morning till late at night"). He holds both Brazilian and French citizenships. He has been noted for his direct, no-nonsense, results-oriented and execution-oriented style in business strategy meetings, but also for his interest in resolving problems from within a company by listening to workers and by cross-functional and cross-cultural team groupings. Ghosn is multilingual, speaking four languages fluently: French, Portuguese, English, and Arabic, and he has also studied Japanese. He maintains ties to Lebanon, where he lived for 10 years and where he completed his primary and secondary education. He is a partner in Ixsir, a winery in the northern coastal town of Batroun, Lebanon. In 2012 he was named to the Honorary Board of the American Foundation of Saint George Hospital in Beirut. Ghosn was hailed as a potential presidential candidate in Lebanon. In a June 2011 survey by life-insurance company AXA, Ghosn was ranked No. 7 in a random poll asking Japanese people, "Which celebrity do you want to run Japan?" (Barack Obama was No. 9, and Prime Minister Naoto Kan was No. 19.) He has so far declined such overtures, saying he has "no political ambitions". As of April 2019, Ghosn is reportedly suffering from kidney failure which has been worsened by his arrests. Beginning in November 2001, Ghosn's life story was turned into a superhero comic book series in Japan, titled The True Story of Carlos Ghosn, in the manga comic book Big Comic Superior. The series was published as a book in 2002. Ghosn also has a Japanese bento box named after him on the menus at some Tokyo restaurants. Bento boxes are popular with businessmen, students, and others who want a quick lunch. The Financial Times called the "Carlos Ghosn Bento" a "measure of the extraordinary rise of Mr. Ghosn in Japan that he should be deemed worthy enough to eat. The Japanese take their food seriously and do not welcome foreign intrusions. As such, the 'Ghosn bento' could be seen as a Japanese way of bestowing acceptance upon him." Ghosn is the subject of a number of books in English, Japanese, and French. In English, he wrote a best-selling business book called Shift: Inside Nissan's Historic Revival. He was the subject of another business book called Turnaround: How Carlos Ghosn Rescued Nissan by David Magee. He also provided strategic business commentary and on-the-job lessons to aspiring managers in a book called The Ghosn Factor: 24 Inspiring Lessons From Carlos Ghosn, the Most Successful Transnational CEO by Miguel Rivas-Micoud. In 2002, he was appointed a Chevalier of the Legion of Honour (Knight of the Legion of Honour) by the French government. In 2002 Fortune awarded him Asia Businessman of the Year. In 2003, he was named Man of the Year by Fortune magazine's Asian edition. In 2003 Fortune listed him as one of the 10 most powerful business leaders outside the U.S. In 2004, he was added to the Automotive Hall of Fame. In 2004, he was also added to the Japan Automotive Hall of Fame. In October 2006, Ghosn was made an Honorary Knight Commander of the Order of the British Empire. In 2010, CEO Quarterly magazine listed Ghosn as one of the "Most Respected CEOs"
In November 2011, CNBC listed Ghosn as Asia Business Leader of the Year. In February 2012, Ghosn was awarded the Grand Cordon of the Order of Ouissam Alaouite, an honorific designation to civilians in recognition of services that benefit Morocco. In June 2012, Ghosn received the Japan Society Award. In October 2012, Ghosn became the first person in the auto industry, and the fourth overall, to win a Lifetime Achievement Award from the Strategic Management Society, a non-profit group that promotes ethical and strategic business stewardship. In October 2012, Ghosn was awarded the Grand Cross of the Order of Isabella the Catholic, an honorific designation to civilians in recognition of services that benefit Spain. In 2013, he was appointed an International Fellow of the Royal Academy of Engineering. Ghosn, Carlos. SHIFT: Inside Nissan's Historic Revival. Crown Publishing Group, 2007. ^ Millikin, John P.; Fu, Dean (2005). "The Global Leadership of Carlos Ghosn at Nissan" (PDF). Thunderbird International Business Review. 47 (1): 121–137. doi:10.1002/tie.20043. ^ Maynard, Micheline (2003). The End of Detroit: How the Big Three Lost Their Grip on the American Car Market. Crown Publishing Group. pp. 117–. ISBN 978-0-385-51152-0. ^ CNN. "The Gaijin with two jobs". CNN. December 7, 2006. ^ CNN. "Lebanon put Carlos Ghosn on its postage stamps. His downfall has stunned Beirut". CNN. November 23, 2018. ^ Schmitt, Bertel. "Top 10 Global Automakers: PSA Out, Daimler In". Forbes. June 14, 2017. ^ The Renault–Nissan Alliance reports record sales of 7,276,398 units in 2010 Archived 2012-04-03 at the Wayback Machine. Renault–Nissan Alliance. January 28, 2011. ^ "Renault–Nissan Alliance posts record sales in 2011 for third consecutive year". Renault.com. February 1, 2012. ^ ALLIANCE FACTS & FIGURES 2013. Renault–Nissan Alliance. 2013. ^ ALLIANCE FACTS & FIGURES 2014. Renault–Nissan Alliance. 2014. ^ Donnelly, Tom; Donnelly, Tim; Morris, David. "Renault 1985–2000: From bankruptcy to profit". Caen Innovation Marché Entreprise, IAE CAEN Basse-Normandie, 2004. ^ a b Litterick, David. "'Le Cost Killer' faces toughest test". The Telegraph. July 4, 2006. ^ Fonda, Daren (2003-05-19). "Motor Trends: Le Cost Killer". Time. ^ a b Taylor III, Alex. "Awards". Fortune. February 18, 2002. ^ a b "Ghosn forecasts record Nissan profit for FY 2001". Kyodo News International. February 25, 2002. ^ a b Loomis, Carol J. "The 25 most powerful people in business". Fortune. August 11, 2003. ^ a b Ali, Arif. "Nissan Opens Largest Showroom in Oman". Arab News. June 5, 2005. ^ Gaspar, et al. Introduction to Business. Houghton Mifflin, Cengage Learning, 2008. p. 258. ^ "The World's Most Respected Leaders: Do You Agree?". Fast Company. November 23, 2004. ^ Brooke, James. "Nissan chief staying put". The New York Times. November 20, 2005. ^ "WORLD'S MOST RESPECTED COMPANIES 2005". FinFacts.ie. 2005. ^ Mackintosh, James. "Carlos Ghosn: superstar car executive". Financial Times. 19 November 2004. ^ Mackintosh, James. "A superstar leader in an industry of icons". Financial Times. 16 December 2004. ^ Berfield, Susan (2008-02-21). "Career Advice from a Comic Book". Businessweek.com. Retrieved 2011-09-27. ^ a b c Soblefeb, Jonathan. "Carlos Ghosn, Executive Who Revived Nissan, Will Step Aside". The New York Times. February 22, 2017. ^ AlAraby. "Nissan chairman Carlos Ghosn has been arrested in Japan, over alleged financial misconduct". Alaraby. November 19, 2018. ^ Rich, Motoko; Ewing, Jack (2018-11-19). "Nissan Chairman, Carlos Ghosn, is arrested over financial misconduct allegations". The New York Times. Retrieved 2018-11-22. ^ "Carlos Ghosn: Nissan sacks chairman over cash scandal". BBC. 2018-11-22. Retrieved 2018-11-22. ^ McCurry, Justin (2018-11-22). "Nissan board sacks chairman Carlos Ghosn after "serious misconduct" claims". The Guardian. Retrieved 2018-11-22. ^ a b Reuters (2018-11-26). "Mitsubishi ousts Ghosn as chairman after Nissan firing". The Irish Times. Retrieved 2018-11-26. ^ Rich, Motoko (2018-11-26). "Carlos Ghosn is removed as chairman of Mitsubishi Motors". The New York Times. Retrieved 2018-11-26. ^ a b c Kottasová, Ivana (11 January 2019). "Oil price rally; Carlos Ghosn indicted again; Fed worries". CNN. Retrieved 12 January 2019. ^ a b Jolly, Jasper (24 January 2019). "Renault names new chairman and CEO after Carlos Ghosn quits". The Guardian. Retrieved 26 January 2019. ^ "Carlos Ghosn: Nissan ousts former boss from its board". BBC. 2019-04-08. Retrieved 2019-04-08. ^ Ghosn, Carlos. SHIFT. pp. 1–2. ^ Ghosn, Carlos. SHIFT. p. 3. ^ Ghosn, Carlos. SHIFT. p. 4. ^ a b c d Ghosn, Carlos. SHIFT. p. 5. ^ a b c d e f g h i j Renault Nissan. Carlos Ghosn: Chairman and Chief Executive Officer, Renault–Nissan Alliance Archived 2014-09-24 at the Wayback Machine. IE University. IE.edu. March 3, 2011. ^ Ghosn, Carlos. SHIFT: Inside Nissan's Historic Revival. Crown Publishing Group, 2006. Chapter 1 (excerpt). ^ Ghosn, Carlos. SHIFT. p. 9. ^ Carlos Ghosn: Chairman and Chief Executive Officer, Nissan Motor Co., Ltd. NissanUSA.com. Retrieved November 22, 2014. ^ Ghosn, Carlos. SHIFT. pp. 18–23. ^ Ghosn, Carlos. SHIFT. p. 24. ^ Ghosn, Carlos. SHIFT. p. 27. ^ a b Kase, Kimio; Sáez-Martinez, Francisco J.; Riquelme, Hernán. Transformational CEOs: Leadership and Management Success in Japan. Edward Elgar Publishing, 2005. p. 125. ^ a b Inoue, Kae (2005-03-28). "Carlos Ghosn, After Fixing Nissan, Faces Renault's Rising Costs". Bloomberg. Retrieved 2011-09-27. ^ a b c d e f g Muller, Joann. "The Impatient Mr. Ghosn". Forbes. May 12, 2006. ^ "Carlos Ghosn Promotes Diversity in Business". AUBulletin Today. American University of Beirut. October 2007, Vol. 9 No. 1. ^ Carlos Ghosn on Diversity on YouTube. Interview clip with TBWA creative director Rob Schwartz. 2009. ^ a b "Carlos Ghosn Biography". Encyclopedia of World Biography. Retrieved 2011-09-27. ^ Ghosn, Carlos. SHIFT. p. 34. ^ a b "Carlos Ghosn headed Michelin North America before turning around Nissan" Archived 2015-10-10 at the Wayback Machine. GreenvilleRoots.com. ^ Ghosn, Carlos. SHIFT. pp. 38–43. ^ Ghosn, Carlos. SHIFT. p. 59. ^ Ghosn, Carlos. SHIFT. p. xvii. ^ Renault–Nissan Allance, December 2005 (handbook). Nissan-Global.com. p. 40. ^ Kase, Kimio; Sáez-Martinez, Francisco J.; Riquelme, Hernán. Transformational CEOs: Leadership and Management Success in Japan. Edward Elgar Publishing, 2005. p. 122. ^ Alliance Facts & Figures 2008. Nissan-Global.com. 2008. ^ Thornton, Emily and Kathleen Kerwin. "Nissan Is Back In The Mud". Businessweek (International Edition). November 1, 1998. ^ Thornton, Emily. "The Debt That's Dragging Nissan Downhill". Businessweek (International Edition). April 4, 1999. ^ "Nissan triples loss forecast". CNNMoney. April 16, 1999. ^ "Renissant?". The Economist. March 18, 1999. ^ a b NISSAN REVIVAL PLAN. Nissan-Global.com. October 18, 1999. ^ The Nissan Revival Plan: Success Ahead of Schedule. Nissan Annual Report 2001. Nissan-Global.com. 2002. ^ Ghosn, Carlos. SHIFT. pp. 120–121. ^ Ghosn, Carlos. SHIFT. pp. xix, 123. ^ Simison, Robert L. and Norihiko Shirouzu. "Nissan to Close Five Plants, Cut Staff By 14% as Part of Restructuring Plan" Archived 2017-04-15 at the Wayback Machine. The Wall Street Journal. October 19, 1999. ^ "Nissan Motor Corporation, Japan". Automotive Intelligence. AutoIntell.com. 2000. ^ Mas, Isabelle. "Renault: Le précédent: quand Ford a débarqué au Japon pour sauver Mazda". L'Expansion. September 23, 1999. ^ Ghosn, Carlos. "Saving the Business Without Losing the Company – Breaking with Tradition in a Foreign Land". Harvard Business School Working Knowledge. March 18, 2002. ^ Ghosn, Carlos. SHIFT. p. 153. ^ a b Snyder, Bill. "Carlos Ghosn: Five Percent of the Challenge Is the Strategy. Ninety-five Percent Is the Execution". Stanford Graduate School of Business. July 9, 2014. ^ Nezu, Risaburo (1999-10-19). "Carlos Ghosn: cost controller or keiretsu killer?". OECD Observer. Retrieved 2011-09-27. ^ Shirouzu, Norihiko. "Nissan's Plan for Jump-Start Faces Formidable Obstacles" Archived 2017-04-15 at the Wayback Machine. The Wall Street Journal. October 18, 1999. ^ a b c Nakae, Koji. Cultural Change: A Comparative Study of the Change Efforts of Douglas MacArthur and Carlos Ghosn in Japan Archived September 7, 2012, at the Wayback Machine. MIT Sloan School of Management (MBA thesis). June 2005. ^ Thornton, Emily. "Remaking Nissan: A long, hard day with Carlos Ghosn, the foreigner remaking Japan's giant" Archived November 13, 2014, at the Wayback Machine. BusinessWeek (International Edition). November 15, 1999. ^ Ghosn, Carlos. SHIFT. pp. 161–163. ^ "Nissan Announces Record Results For FY 2000". Scoop. May 31, 2001. ^ "Nissan reports an operating profit of 82.6 billion Yen, a net loss of 684.4 billion Yen for Fiscal Year 1999 ended March 31, 2000 and forecasts a net profit of 60 billion Yen in Fiscal Year 2000" Archived December 1, 2015, at the Wayback Machine. Nissan Press Release. Nissan-Global.com. May 19, 2000. ^ Shirouzu, Norihiko (2006-07-07). "What Alliance With Mr. Ghosn Could Bring GM". The Wall Street Journal. ^ Ghosn, Carlos. SHIFT. p. xix. ^ Verburg, Robert; Ortt, J. Roland; Dicke, Willemijn M. Managing Technology and Innovation: An Introduction. Routledge, 2006. p. 301. ^ NISSAN 180: Ready and Positioned for Growth. Nissan Annual Report 2001. Nissan-Global.com. 2002. ^ Bhatia, Monish K. "'Nissan 180' complete, annual sales reach 3.67 million". LeftLane.com. October 6, 2005. ^ Kase, Kimio; Sáez-Martinez, Francisco J.; Riquelme, Hernán. Transformational CEOs: Leadership and Management Success in Japan. Edward Elgar Publishing, 2005. p. 136. ^ Annual Report Year Ended March 31, 2003. Nissan-Global.com. ^ NISSAN 180 Update and FY2003 Financial Results, Apr.26, 2004 Nissan-Global.com. April 26, 2004. ^ Ibison, David. "Nissan sees modest growth after record profit". Financial Times. April 25, 2005. ^ "Strong global sales boost Nissan's profit". Associated Press. October 28, 2005. ^ "Nissan reaches vehicle sale growth target". Associated Press. October 6, 2005. ^ Taylor III, Alex (2006-07-10). "How would Ghosn fix GM?". CNN. ^ "Kirk Kerkorian Biography". Encyclopedia of World Biography. Retrieved 2011-09-27. ^ Sabatini, Jeff. "Book: Ghosn would've taken top spot at Ford, but only if named CEO and Chairman". Autoblog.com. March 12, 2012. ^ "Ford book: Bill fumed over Focus; Ghosn eyed the crown". Automotive News. March 12, 2012. ^ Moffett, Sebastian. "Nissan, Renault Place a Big Bet On Electric Cars". The Wall Street Journal. September 14, 2009. ^ a b Squatriglia, Chuck. "Q&A: Renault–Nissan CEO Pledges $5.6 Billion for EVs". Wired. June 16, 2011. ^ David Welch (May 26, 2010). "Nissan's Ghosn gambles big on electric cars". BusinessWeek. Archived from the original on 2011-04-17. Retrieved 2011-09-27. ^ "Renault–Nissan and Project Better Place prepare for first mass marketed electric vehicles" Archived 2016-03-03 at the Wayback Machine. (Press release) Nissan-Global.com. January 21, 2008. ^ Chambers, Nick. "Nissan & Oregon Team Up to Bring Electric Cars to the Masses". Gas2.org. November 20, 2008. ^ "Electricity and Cars". World Nuclear Association. October 2014. ^ "Renault–Nissan CEO Carlos Ghosn: 'Now Is the Time for the Electric Car' – Knowledge@Wharton". Knowledge.wharton.upenn.edu. Retrieved 2011-09-27. ^ de Courson, Roland. "Nissan Unveils 'Leaf' Electric Car". IndustryWeek. August 2, 2009. ^ NISSAN UNVEILS "LEAF" - THE WORLD'S FIRST ELECTRIC CAR DESIGNED FOR AFFORDABILITY AND REAL-WORLD REQUIREMENTS Archived 2012-02-10 at WebCite. Nissan Motor Corporation. August 2, 2009. ^ "Nissan delivers first LEAF cars in Japan". International Business Times. 2010-12-22. Retrieved 2014-09-25. ^ Schmitt, Bertel. "Renault–Nissan Alliance Trounces Tesla 2:1 (Or Worse.)". Forbes. April 7, 2017. ^ Schmitt, Bertel (May 17, 2011). "With Nissan's Carlos Ghosn Near Fukushima. A Glowing Report". The Truth About Cars. Retrieved 2011-09-27. ^ Nishimura, Koji; Nomura, Shu; Komori, Atsushi. "Nuclear crisis overshadows manufacturers' restoration efforts" Archived October 6, 2014, at the Wayback Machine. Asia & Japan Watch. March 30, 2011. ^ "Ghosn vows to reopen Iwaki plant in April". Japan Times. March 30, 2011. ^ a b "Carlos Ghosn interview on "World Business Satellite" – TV Tokyo". Facebook. 2011-04-08. Retrieved 2011-09-27. ^ Zulovich, Nick. "Nissan & Toyota Celebrate More Production Restoration". Auto Remarketing. May 19, 2011. ^ Kim, Chang-Ran (2011-05-17). "UPDATE 1-Nissan working to restore full production before Oct-CEO". Reuters. ^ Nissan CEO Carlos Ghosn Iwaki Visit (Full Version). (video) Uploaded May 19, 2011. ^ "現場に甘えぬ経営者 震災対応第２幕、問われる決断". Nihon Keizai Shimbun. June 5, 2011. ^ March 29, 2011 broadcast 23:00 to 23:58 (broadcast notes). TV Tokyo. ^ "Ghosn visits affected Nissan factory to encourage employees". News24.jp. May 17, 2011. ^ Kitamura, Makiko and Yuki Hagiwara. "Ghosn Says Suppliers Recovering From Quake". Bloomberg. May 12, 2011. ^ Jolley, David (29 June 2013). "Ghosn becomes chairman of Russian carmaker AvtoVAZ". europe.autonews.com. Automtive News Europe. Archived from the original on 29 June 2013. Retrieved 29 June 2013. ^ Co, Brent. "Russian carmaker Avtovaz names Carlos Ghosn Chairman". AutoIndustriya.com. June 29, 2013. ^ Avtovaz OAO: Directors & Officers – Carlos Ghosn. Financial Times. Retrieved November 11, 2014. ^ Carlos Ghosn. NissanNews.com. Retrieved July 11, 2016. ^ RENAULT AND AVTOVAZ CONFIRM THEIR STRATEGIC PARTNERSHIP. Renault (press release). February 29, 2008. ^ "Renault–Nissan to take control of Lada-owner Avtovaz". BBC News. May 3, 2012. ^ Ostrouk, Andrey. "Renault, Nissan Buy Majority Stake in Russia's Avtovaz". The Wall Street Journal. June 27, 2014. ^ McLain, Sean; Sylvers, Eric. "Renault–Nissan's Carlos Ghosn Sees Paris as Hurdle to Auto Merger". The Wall Street Journal. February 23, 2017. ^ a b c d e f g h i j McLain, Sean; Dvorak, Phred; Schechner, Sam; Kowsmann, Patricia (16 December 2018). "The Fall of the House of Ghosn". The Wall Street Journal. Retrieved 17 December 2018. ^ a b c d e Alderman, Liz (16 January 2019). "French Government Calls for Carlos Ghosn to Be Replaced as Renault's Leader". The New York Times. Retrieved 21 January 2018. ^ Ma, Jie; Horie, Masatsugu. "Nissan Seals $2.3 Billion Mitsubishi Motors Stake Acquisition". Bloomberg News. October 19, 2016. ^ "Nissan to take 34% stake in Mitsubishi Motors". BBC News. May 12, 2016. ^ Greimel, Hans. "Nissan takes control of Mitsubishi with Ghosn as chairman". Automotive News Europe. October 20, 2016. ^ "Itaú Unibanco forms International Advisory Board". Banco Itaú. Retrieved November 24, 2014. ^ "Organizational Structure". Itaú. Itaú. Retrieved 6 October 2015. ^ "First Nissan-Tsinghua Lecture on Renault–Nissan Alliance". Tsinghua University. June 4, 2012. ^ "Carlos Ghosn tells students to embrace diversity" Archived 2012-05-05 at the Wayback Machine. American University of Beirut News. August 28, 2007. ^ The Secretary General's High-Level Group on Sustainable Engery for All: Carlos Ghosn Archived September 27, 2013, at the Wayback Machine. United Nations. UN.org. Retrieved November 24, 2014. ^ "Carlos Ghosn elected ACEA President". ACEA – European Automobile Manufacturers Association. 12 May 2014. Retrieved 19 January 2016. ^ "Carlos Ghosn re-elected President of ACEA for 2015". ACEA – European Automobile Manufacturers Association. 5 December 2014. Retrieved 19 January 2016. ^ "Dieter Zetsche elected ACEA President for 2016". ACEA – European Automobile Manufacturers Association. 8 December 2015. Retrieved 19 January 2016. ^ "Carlos Ghosn – Chairman and Chief Executive Officer". Renault. Renault. Retrieved 6 October 2015. ^ Ma, Jie (27 November 2018). "Ousted chairman Ghosn accused of making Nissan pay for his personal investment losses". South China Morning Post. Retrieved 11 January 2019. ^ Le Point. "'Du côté des autorités japonaises et françaises, un seul mot d'ordre: la stabilité de l'alliance' Renault–Nissan–Mitsubishi Motors". Le Point. November 20, 2018. ^ a b "Nissan boss Carlos Ghosn arrested over 'misconduct'". BBC. 19 November 2018. Retrieved 19 November 2018. ^ 日本放送協会. "東京地検 日産本社を捜索 金融商品取引法違反の疑い - NHKニュース". nhk.or.jp. Retrieved 19 November 2018. ^ a b c Reidy, Gearoid (19 November 2018). "Ghosn's Downfall Sparks Questions on Links to Property, Expenses". Bloomberg. Retrieved 20 November 2018. ^ "The Chairman of Nissan Has Been Arrested in Tokyo. Here's Why". Fortune. 19 Nov 2018. Retrieved 19 Nov 2018. ^ Ma, Jie (19 November 2018). "Nissan's Ghosn Arrested in Japan, Threatening Three-Way Alliance". Bloomberg. Retrieved 20 November 2018. ^ "Ghosn says he told staff to handle pay reporting legally". Nikkei Asian Review. Retrieved 28 November 2018. ^ "Experts said pay reporting unnecessary, Ghosn aide says". Nikkei Asian Review. Retrieved 28 November 2018. ^ "Ghosn scandal puts spotlight on Japan's judicial system". Nikkei Asian Review. Retrieved 28 November 2018. ^ a b McLain, Sean (20 December 2018). "Carlos Ghosn Re-Arrested on Suspicion of Shifting Personal Losses to Nissan". The Wall Street Journal. Retrieved 20 December 2018. ^ a b c Shirouzu, Norihiko (27 December 2018). "Nissan sources link latest Ghosn allegations to Khaled Al-Juffali, vice chairman of one of Saudi Arabia's largest conglomerates". Reuters. Retrieved 6 January 2019. ^ AFP (8 January 2019). "Carlos Ghosn: The allegations and the rebuttals in the case of the ex-Nissan chairman". straitstimes. Retrieved 11 January 2019. ^ a b Atiyeh, Clifford (9 January 2019). "Ex-Nissan Chairman Carlos Ghosn Says He's "Wrongly Accused" of Financial Misconduct; Appeal for Release Pending Trial Rejected". Car and Driver. Retrieved 9 January 2019. ^ "Carlos Ghosn: Ex-Nissan chair faces two new charges". BBC News. 11 January 2019. Retrieved 11 January 2019. ^ Kageyama, Yuri (11 January 2019). "Former Nissan Chairman Carlos Ghosn Charged With Breach of Trust". TIME. Retrieved 11 January 2019. ^ McLain, Sean (13 January 2019). "Ghosn Received $8 Million From Nissan-Mitsubishi Entity, Nissan Probe Alleges". The Wall Street Journal. Retrieved 13 January 2019. ^ LeBeau, Phil (20 January 2019). "Ex-Nissan CEO Carlos Ghosn makes new request for bail, offering up passports and Nissan stock as collateral". CNBC. Retrieved 20 January 2019. ^ a b c d Atiyeh, Clifford (17 January 2019). "The Japanese are Mistreating Ousted Nissan CEO Carlos Ghosn in Jail, Says His Wife". Car and Driver. Retrieved 17 January 2019. ^ Landers, Peter (21 January 2018). "Carlos Ghosn's Revised Bail Request Rejected by Tokyo Court". The Wall Street Journal. Retrieved 21 January 2018. ^ a b Reuters (11 January 2019). "Nissan top executive resigns amid broadened investigation of ex-Chairman Ghosn". Reuters. Retrieved 12 January 2019. ^ Inoue, Kae; Horie, Masatsugu (17 January 2019). "Nissan May Scrap Chairman Role as It Rebuilds, Director Says". Bloomberg.com. Retrieved 21 January 2019. ^ "Nissan might sue ousted chairman Carlos Ghosn". AlphaStreet. 16 January 2019. Retrieved 21 January 2019. ^ Ma, Jie; Inoue, Kae (23 November 2018). "Nissan Pushes for More Power in Post-Ghosn Alliance". Bloomberg.com. Retrieved 21 January 2019. "According to Japanese corporate law, Renault's voting rights [in Nissan] could be canceled if Nissan raises its shareholding to more than 25 percent in the French carmaker. Under French rules, if Renault lowered its stake in Nissan below 40 percent, then it will help the Japanese carmaker get voting rights in the French company." ^ "Exclusive interview: Ghosn says 'plot and treason' led to arrest". Nikkei Asian Review. 30 January 2019. Retrieved 30 January 2019. ^ Nishimura, Karyn (2019-02-17). "With legal team shake-up, Ghosn seeks punchier defense". Japan Today. Retrieved 2019-02-17. ^ Dooley, Ben (4 March 2019). "Carlos Ghosn, Former Nissan Chairman, Is Granted Bail Request in Japan". The New York Times. Retrieved 5 March 2019. ^ NYT Editorial Board (February 21, 2019). "Opinion: Carlos Ghosn Faces Japanese 'Justice'". The New York Times. Retrieved 22 February 2019. The charges against Mr. Ghosn (pronounced “Gohn”) are serious. ^ "Nissan ex-boss Ghosn released after 108 days". ^ "Ghosn's bail conditions from surveillance cameras to no internet access". The National, Abu Dhabi. ^ "Ousted Nissan Chairman Ghosn says on Twitter he's 'ready to tell the truth'". CNBC. 3 April 2019. Retrieved 3 April 2019. ^ "Carlos Ghosn, Former Nissan Chairman, Is Arrested on New Allegations". The Wall Street Journal. 3 April 2019. Retrieved 3 April 2019. ^ "Tokyo prosecutors rearrest Carlos Ghosn on alleged aggravated breach of trust: reports". The Japan Times. 3 April 2019. Retrieved 3 April 2019. ^ Atiyeh, Clifford (9 April 2019). "Ousted Nissan Chief Carlos Ghosn Fires Back in Video Claiming Conspiracy and Backstabbing". Car and Driver. Retrieved 9 April 2019. ^ a b "The Gaijin with two jobs". CNN. December 7, 2006. ^ Kim, Leena (March 3, 2017). "Carole and Carlos Ghosn Threw a Wedding Fit For a King and Queen". Town & Country. ^ Dumaine, Brian. "Renault–Nissan: Can anyone succeed Carlos Ghosn?". Fortune. December 29, 2014. ^ "The True Story of Carlos Ghosn". CNN. June 16, 2008. ^ Karam, Michael. "Lebanon reluctant to recognise a big local success story" Archived 2011-10-21 at the Wayback Machine. The National. October 20, 2011. ^ Saint George Hospital – Our Mission Archived 2014-10-06 at the Wayback Machine. Saint George Hospital. StGeorgeFoundation.org. Retrieved November 24, 2014. ^ Mosalli, Irène. "Pour sa capacité à « faire la différence », Carlos Ghosn honoré par la Fondation américaine de l’Hôpital Saint-Georges". L'Orient-Le Jour. November 19, 2012. ^ a b Sami Moubayed (July 1, 2009). "Man behind the wheel". Forward Syria. Archived from the original on July 11, 2011. Retrieved 2011-09-27. ^ "Nissan chief Ghosn shrugs off Lebanon politics career". Agence France-Presse. July 17, 2014. ^ "Japan chooses Kitano Takeshi in AXA Life Survey" Archived October 28, 2012, at the Wayback Machine. Kyodo News. 47news.jp. June 27, 2011. ^ Schmitt, Bertel. "With Carlos Ghosn Down By The Waterfront". TheTruthAboutCars.com. July 16, 2011. ^ "Survey after the earthquake": 10,000-person survey. (Japanese) AXA Life. AXA.co.jp. June 27, 2011. p. 9. ^ "Survey later the earthquake, maximum Japanese meditation entrusted Takeshi Kitano". June 28, 2011. ^ Kelly, Tim (11 April 2019). "Exclusive: Ghosn, suffering from kidney failure, was arrested illegally - defense document". Reuters. Retrieved 11 April 2019. ^ Zaun, Todd. "Nissan's Carlos Ghosn Becomes Unlikely Star of Japanese Comic". Archived from the original on 2007-12-28. Retrieved 2007-10-16. CS1 maint: BOT: original-url status unknown (link) The Wall Street Journal. December 27, 2001. ^ "Winding up 2002" Archived February 14, 2008, at the Wayback Machine. Big Comic Superior Newsletter. January 18, 2003. ^ a b Ibison, David and James Mackintosh. "The boss among bosses". Financial Times. 7 July 2006. ^ Ghosn, Carlos. Shift: Inside Nissan's Historic Revival. Crown Business, 2006. ^ Magee, David. Turnaround: How Carlos Ghosn Rescued Nissan. HarperBusiness, 2003. ^ Rivas-Micoud, Miguel. The Ghosn Factor: 24 Lessons the World's Most Dynamic CEO. McGraw-Hill, 2006. ^ "La promotion de Pâques". Le NouvelObs. 2 April 2002. Retrieved 10 May 2017. ^ "Nissan's Ghosn to be registered in Automotive Hall of Fame". Kyodo News International. October 28, 2004. ^ "カルロス・ゴーン（Carlos Ghosn）氏　略歴". Japan Automobile Hall of Fame. Archived from the original on 2016-03-04. Retrieved 2014-08-03. ^ "Carlos Ghosn Biography and Interview". www.achievement.org. American Academy of Achievement. ^ "Car maker turnaround king Ghosn now a knight". Reuters. October 24, 2006. ^ Most Respected CEOs Archived August 23, 2011, at the Wayback Machine. CEO Quarterly. 2010. ^ Bagchee, Deepanshu. "Carlos Ghosn Named Asia Business Leader of the Year" Archived November 27, 2011, at the Wayback Machine. CNBC. November 24, 2011. ^ Japan Society 2012 Annual Dinner Archived May 19, 2012, at the Wayback Machine. Japan Society. June 7, 2012. ^ "Ghosn wins 'lifetime achievement' award from Strategic Management Society" Archived 2012-10-19 at the Wayback Machine. Renault–Nissan Alliance. October 8, 2012. ^ Ghosn: by royal appointment". Renault–Nissan Alliance. October 29, 2012. ^ List of Fellows. Royal Academy of Engineering. Retrieved November 24, 2014.